Triathlon, famous sport.........winter triathlon? Why not to give it a go, it is madness of those who lack triathlon in winter and there are always handful of "mentally ill" athletes who are keen to snow run-snow bike- cross country ski. I am one of them. This winter triathlon was held at my home town of Jablonec nad Nisou, beautiful town in the mountains. It was very cold morning (well not very, just -10 celsius). Sun was shining and it looked like perfect day. With the start gun we started with 5km run. I pushed it straight from the beginning just for fun and I was just waiting when the crisis will come, it came soon and after while I was slowing down and moving through the field. There was 13km on the bike waiting for us and it was extremly icy. I didn´t know until I tasted the ice from very close (elegantly falling of my bike). Feeling good on the bike I moved through the field up again and without any other crashes came to transition on third place. Transition is my adventage so I use it in my profit and hit the white stuff on my skis on second place with good gap behind. 7km xc ski and very hilly. I don´t know worse transition than going from the bike to skis. 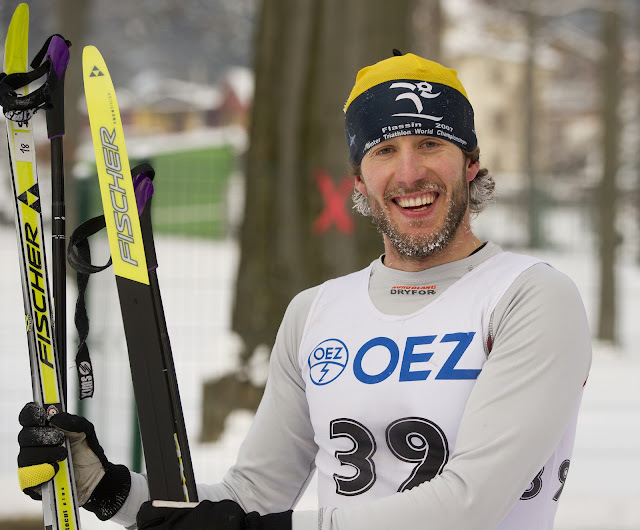 Anyway, after not smiling for 20mins of skiing I became second in the first race of Czech Winter TT Cup.